I often find myself missing Pasadena during the cold Kentucky winter, mostly from a motorcycling perspective. Living ten minutes from the Angeles Crest Highway, the ability to escape the smog of the LA basin by quickly climbing a few thousand feet up the San Gabriel Mountains en route to Newcombs Ranch was priceless. And that opportunity was available nearly year-round. 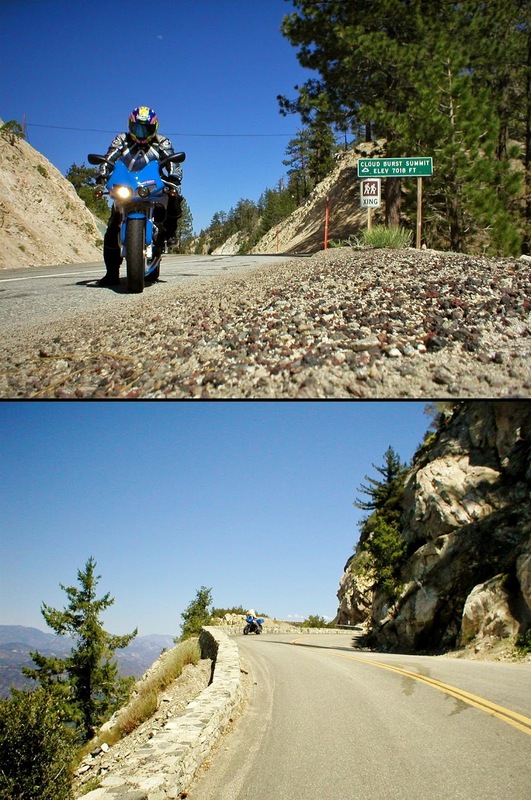 FLASHBACK: Angeles Crest Highway memories, circa 2003. But this year we haven't had much of a winter. 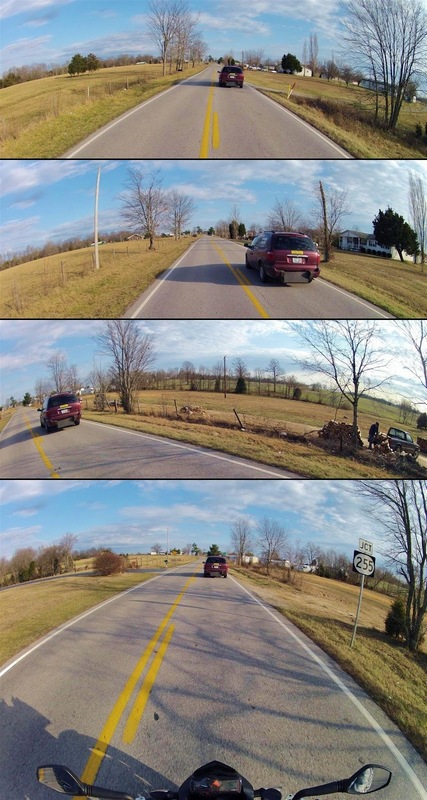 And a warm sunny January day like this reminds me that South Central Kentucky is a fine place to live, too. My favorite BBQ joint is one minute from my house. 12 minutes from home I can be taking an underground boat ride through a cave. 15 minutes from home I can be strolling across a 21,000-student University campus or watching America's favorite sports car roll off the assembly line. An NFL or NHL game is never more than an hour away. And 33 minutes from home I can be eating lunch at Porky Pig Diner in Pig, KY.
No joke. Porky Pig Diner. In Pig, KY. I love Kentucky. It's a fun loop. There's only a few miles of well-traveled straight line road on the way up, and the entire route home is fun twisty backroad stuff. This is a loop the Bowling Green Rocket Club from the late nineties would appreciate, even though no Taco Bell is involved. Apparently there are two places named Rocky Hill, KY. More on that later. I used the GoPro HD Hero2 on the way back, and I dug up some good photos from previous rides to compare the two cameras and the different scenery from the different seasons. The obligatory New Cut Road photo. The rare double-sided matching fence row. This is the most boring stretch of the whole ride, and it doesn't last long. I know that house on the hill. Good people live there. I think we're related somehow. Meet Pound Hound, the official greeter at Porky Pig Diner. Ain't nothin' wrong with that motto. It's true -- the ferries are still pretty important around here. I don't know what they're pointing at. There ain't nothing over there. VERDICT: Fine homestyle country cookin', and served fast! This place was bigger than I expected. I've heard they're known for the catfish and the owner, Mona, said their best dish was the smoked pulled pork BBQ. But I've had my fair share of BBQ lately and I'm not a good judge of catfish, so I went with the roast beef. It was great -- just like you'd do at home in the Crock-Pot -- and it was served in less than two minutes. So I reckon this diner is a good place for a quick meal, if you happen to be looking for a quick meal while you're in the middle of nowhere. But you'll probably enjoy it more more if you have time to relax and chat while you eat (I'm sure you can meat some real characters here). They have a big menu and plenty of dessert choices, so I look forward to coming back to try the BBQ and the cherry cobbler. I'll return with some of my motorcycle friends soon. You can see PH's doghouse over there next to the ice. KTM Super Duke R. I love her. "Mammoth Cave National Park -- A World Heritage Site and International Biosphere Reserve"
I have no idea what that means, but I didn't mean to go this way so I'm turning around. FLASHBACK: The same spot last June. 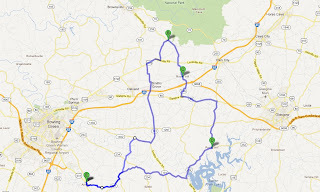 While riding some of these roads over the past year I kept seeing signs for Rocky Hill, but they weren't in the same area. I thought I was losing my mind, but apparently there are TWO Rocky Hill communities -- one in Edmonson County and one in Barren County. That don't make no sense at all. Rocky Hill, KY (Edmonson County). FLASHBACK: It looked a little different in Summer. Across the tracks is the Rocky Hill Inn B&B. It was built in 1857 and they do provide ear plugs for the guests. Dang! I'm gonna say this was a total loss. Apparently Rocky Hill buildings are still burning to the ground. ...and the road is often pretty dirty. That awkward moment where you pull out to pass just as you spot the road sign you 've been looking for. 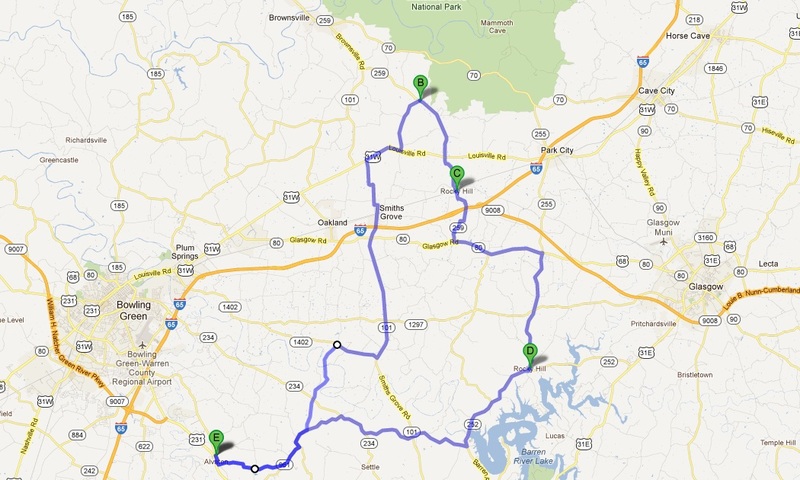 I love 255, especially the portion between 1297 & 252 -- cool farms and fun curves. Rocky Hill, KY (Barren County). I had to backtrack for a quarter mile to find the road sign on 1297. Rocky Hill Missionary Baptist Mission. The Dam Store is still closed, baby... the Dam Store is still closed. But the big parking lot is a fine place to stop and check voice mails & emails on a workday. Barren River Lake Dam. The water is low. Just a cow and her reflection. FLASHBACK: It didn't look much different in October. FLASHBACK: But it did look different in September! FLASBACK: It looked different in October. They cut a bunch of trees down. Boo! There's my favorite picture ever again. BBQ Pork Sandwich & Potato Salad. Catfish (complete with Hush Puppies) & Cole Slaw (to go). Cool ride Rob. And you have a Jeep too! I have wanted a Jeep for the longest time. Some day. The "favorite picture" is great!